It’s National Public Safety Telecommunicators Week and Teamsters Local 700 is proud to represent groups of these unspoken heroes. Thank you to the Teamsters Local 700 members who are dispatchers and operators for the life-saving services you provide to your respective communities. Pictured left are the Teamsters from the Grundy County 911 Dispatch Center who do this important work everyday. Ken Briley, the Sheriff of Grundy County, (pictured far left), along with members of his staff, stopped by to thank these members for their hard work. April 17, 2019 – As National Public Safety Telecommunicators Week continues, we recognize our 911 dispatchers and operators at the City of Chicago. 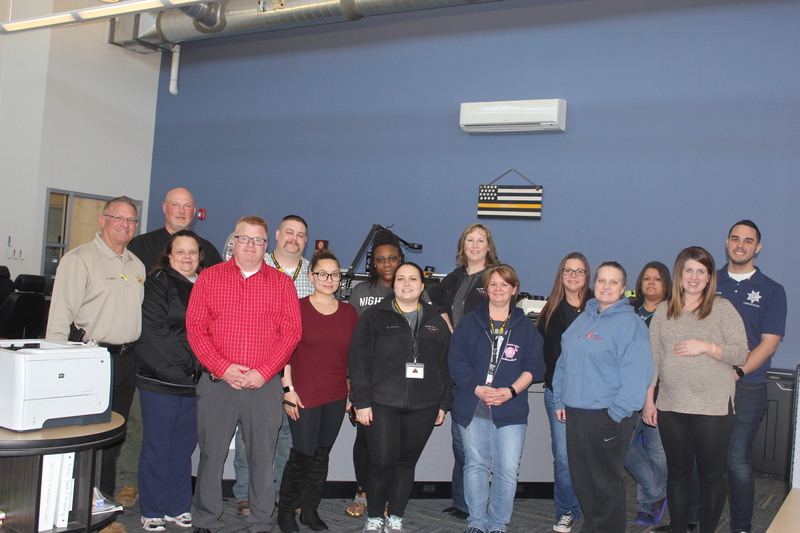 The Office of Emergency Management and Communications (OEMC) group and the SPCO’s in Chicago’s 911 center are all hardworking members of Teamsters Local 700. Pictured below with some of these unsung heroes are Teamsters Local 700 Secretary-Treasurer Vincent F. Tenuto, Jr. (pictured left) and Teamsters Local 700 Trustee Anthony L. McGee (pictured right).